If you aren’t already familiar with what Bitcoin is you can check out our other article here where we go over what exactly Bitcoin and cryptocurrencies are. But if you’re already in the know let’s try and answer the big question on everyone’s mind. Is Bitcoin and the cryptocurrency market a bubble? Depending on who you ask, it’s likely that you’ll get varying answers. 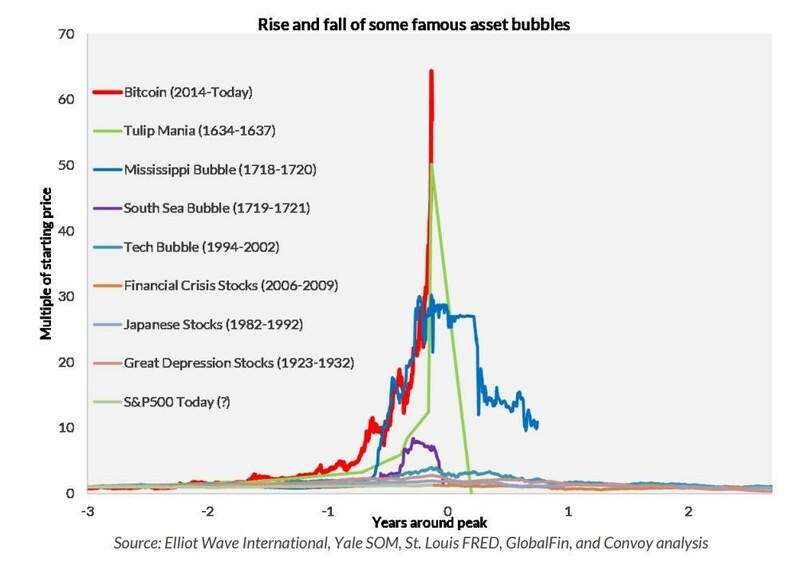 There’s one school of that believes this is indeed another financial bubble, and one of the largest we’ve seen in recorded history. Below is a chart to help you understand just how big this thing really is. Bitcoin was first theorized in 2008 and officially created on January of 2009. Starting with a value of basically nothing, Bitcoin appreciated in value slowly over time. On March 22, 2010 the first real world purchase of Bitcoin was made in Jacksonville, Florida where Laszlo Hanyecz bought 2 pizzas for 10,000 Bitcoin. Soon after that Bitcoin saw a 1000% increase in a matter of five days. By early 2011 Bitcoin had reached parity with the U.S. Dollar. From there’s it’s only continued to grow eventually reaching the price of about $1,000 per Bitcoin before crashing back down to about $200-300. But in early November of 2015 things started to pick back up with Bitcoin and it’s value surged again from that $200-300 range all the way up to $19,000 on exchanges like Coinbase. We’ve since seen another huge draw back in price, dipping as low as $11,000 but at the time of writing this article the price has rebounded again to about $14,600. Some saw the initial rise and fall in Bitcoin value as a bubble and many are holding the same views of its tremendous growth this time around as well. Though we did see a huge dip in the market it’s unlikely that the bubble has popped, if it is indeed a bubble. Those who hold this perspective have strong reasons to believe they’re right. 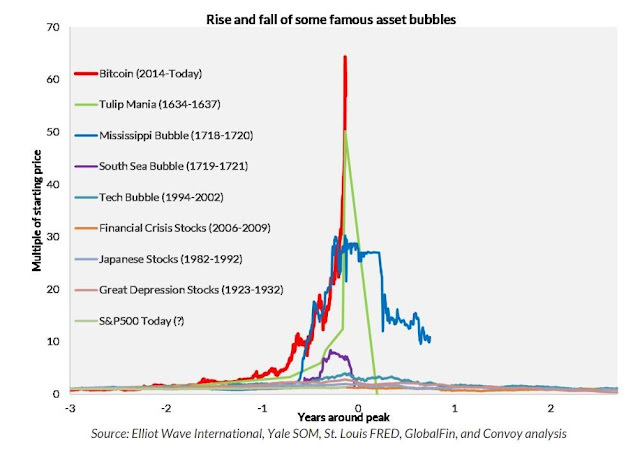 After all, Bitcoin does exhibit all the characteristics of a bubble. There’s lots of liquidity which allows gambling. There’s a lot of leverage allowing people to bet more than they have. There is democratization to make the phenomenon more commonplace for the public. We have new issues with the thousands of cryptocurrencies available on the market with ICO’s becoming ever more popular. And lastly there is turnover with trading volumes increasing by the day. There however is another school of thought though that claims that there is an unprecedented reason for this sudden rise in value. These individuals see huge potential for cryptocurrencies and believe that we are still in the early stages of a global economic transformation. They believe that this transformation will lead to the largest wealth transfer in human history, or at least within our lifetimes. They also view foreign governments accepting Bitcoin as legal tender as a vote of confidence towards their view of the future for cryptocurrencies. More and more institutions also seem to be dabbling with the idea of incorporating cryptocurrencies into their operations, with some major merchants even accepting Bitcoin as a form of payment. Bitcoin is also increasingly being used as a store of value for citizens of countries where their government’s fiat currencies are failing them. This has been the case for people in countries like Venezuela, Bolivia and Zimbabwe. Furthermore, because Bitcoin has a fixed supply, with 21 million ever allowed in existence, those bullish on Bitcoin see this as gold for the digital age and the path to a new financial future. Only time will tell which of these two views is correct, but for the time being it’s difficult to say with absolute certainty how things will come to unfold.